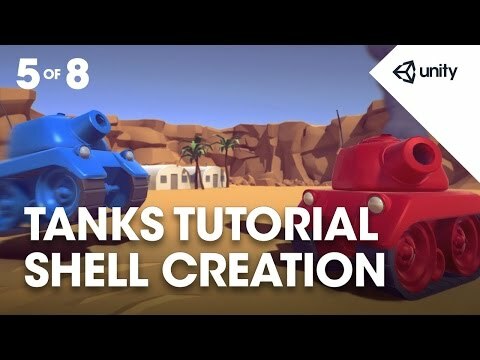 Phase 5 teaches you how to create a Shell for the tank, creating a radius for explosion. give to any of the tanks that i lands near. the closer that that bullet happens to be. Or at least it will do in a moment. Off we go, moving it closer. The closer it is the more damage that will be applied. that will be a huge amount of damage. the TankHealth script that we did before. you will find a model called Shell. If you select it it will look like this in the inspector. at the bottom of the inspector. So what we'll do is drag that in to the hierarchy. the project to the hierarchy. so it's near to 0.
see it and work on it, something like that is fine. where it's positioned for now. it needs to have a collider. we'll use a capsule collider. click on it to confirm, or hit Return. like a projectile as we are. So we don't want any physical interactions. And when we don't want those we use what's called triggers. you automatically open the door. It's a pretty classic use of that kind of collider. we want to do is actually set it up. so the centre value for that is (0, 0, 0.2). And the radius is 0.15. And the height is 0.55.
pretty much match our shell perfectly. Or to an amount of precision that would never cause issues. the physics engine, and so what are we going to add? A rigidbody, there we go, nice and loud. So add our rigidbody component. And it's good to go. they're going to fall with gravity over time. So just a quick recap of those two points. Okay, so we've found the model named Shell in the Models folder. We dragged it in to the hierarchy. that we're going to write. We've checked Is Trigger to make sure that is the case. kind of offset your colliders if you need to, art-wise. And the radius we've set to 0.15, the radius of the capsule. under the control of the physics engine. and nothing is going to really happen. physical presence, like I said. a shell explosion for you. you will find a prefab called ShellExplosion. a child of the shell. A cloud of dust that kind of falls over time. it needs to have visual effects and an audio effect. and I'm going to choose Audio Source. and choose ShellExplosion to assign it. so we're going to uncheck Play On Awake. thing as soon as it hits something. circle select to set the audio clip to ShellExplosion. as soon as it impacts, so we uncheck Play On Awake. is to add a light. we can just add that same light. prefabbed game objects with several components on them. a bunch of different components on it. which has just the light component on it. kind of forces it's going to apply to other tanks in the game. In that you will find a script called ShellExplosion. game object in the hierarchy. and we're going to double click on that to open it up for editing. variables but we do have a bunch of public ones. So the first one is a layer mask. we put all the tanks on the Players layer. and see which tanks we've hit rather than trying to affect everything. and we can choose which layer we want to affect. play the particles when the shell explodes. so we can play a sound. the maximum damage, and we're setting that to 100.
then you'll kill the tank outright. of the tank because the collider is covering it. So you're going to get close but no cigar. that the explosion is going to do right at it's centre. less affected by the explosion, you'll feel less force. if it's not dead after 2 seconds just kill it anyway. but it's just a failsafe that we'll write in. from the shell it's going to affect when it explodes. if it's still alive after 2 seconds, destroy it. And now we're going to have to write some scripts. intersected with and what to do as a result. which we've just called other which is of type Collider. But what do we do first? colliders that we need to affect. and you'll remember that's the square brackets after a collider. And we'll call that array Colliders. or is inside the sphere is going to be collected. so that it's only picking up the tanks. Okay, so just a quick note about layers. to either include of exclude them from something. which only the tanks exist. there's no kind of layering in that sense. decide what we're going to do. loop through them all using a For Loop. through so it's less than colliders.Length. And then i++ means that we add to i for every loop. Then open and close brackets? to affect each of the colliders. so we'll use the angled brackets for rigidbody. the array and try and find a rigidbody on it. found a rigidbody or if it's just found nothing. if there's nothing there then what do I do? on to the next loop, on the the next collider. it's not continuing through a list of commands. everything that's on the Players layer anyway. you're going to get errors. ExplosionForce that we've got as a public variable. Then comma, so we're on to the next parameter. force is emanating from is transform.position. So that's position of the shell. that explosion force can reach. to actually cause some damage to it. So we're going to do something very similar. added using the Add Component button. on a tank, let's go back from the top. within the imaginary sphere, the overlap sphere. to the amount that there is, colliders found. take damage on those tanks. talk to it and reduce health with it. and we're going to set that equal to the targetRigidbody. because we were able to add a force to it. but we're going to check just to make sure. then this will still work. on to the next iteration. So a quick note about this line here. the same game object that we've stored in that. we'll say 'this is a rigidbody object'. All things in the hierarchy are what we call game objects. we know has a rigidbody attached to it. and we'll carry on from there. a component reference to find another component. So that's what's actually happening there. so we know how much damage it needs to take. position of something from the rigidbody as well. we were doing things relative to the rigidbody's position. That's the position that we're going to use here. now we need to apply the damage. And we're going to parse in the amount of damage. and play the correct audio and stuff. we're going to parse that straight to the TakeDamage function. Public being the accessibility level of that thing. sort out the particles and the audio. we don't want it to hang around. still play even after we've destroyed the shell. be part of the shell. So null just means nothing. of game objects in the hierarchy. we've got to do in this function. need to destroy the shell. we're going to give it a delay. that will destroy the component. We want to destroy the game object that those particles are on. the duration of the particle system. 2 seconds, which was a number that decided on. is how long they last for. after how long it lasts for. each particle, but the duration is the entire system. Optional amount of time before destroying the object. and that will simply wait for that to finish and then destroy it. is actually to remove the shell as well. game object that this is on. the explosion but it really doesn't matter in this instance. while we're working on the rest of the stuff. So we're going to get rid of that to start off with, we don't need it. create a vector from the target to the shell. and somewhere in that circle is the target. We're finding a vector between the two. the magnitude of that vector. which would be somewhere between 0 and the radius. We want to know what the relative distance is. rather than a number between 0 and some radius that we found. the radius and the minimum is going to be 0.
starts off at 0 and ends up at 1. We do that by dividing by the explosion radius. and divide all of that by the ExplosionRadius. to be very very small so it'll be near zero. divided by the explosion radius is going to be 1.
trails down to 0 at the edge. So we create a float called damage. then you're going to deal the maximum damage. to do very little damage. We're not finished yet with this function. that the damage is not negative. equal to Mathf.max of 0f and Damage. then set it to 0, otherwise keep it as it is. And then finally we can return that damage. making sure it's not negative? the overlap sphere but it's collider is within it. and then it'll be negative beyond that. it's just not the way. So that's why we're doing that. back to the editor, hopefully there won't be any errors. our script with all those public variables. layer mask and we called it Tank Mask. all of Unity's layer system. Layer drop down at the top. is where we're going to select Players. It's the only thing we want it to actually effect. Tank Mask variable or drop down. parenthesis it says Particle Systems. object because that also has an audio source. But this time when you drag it you'll notice it picks that component. component it'll say 'great, okay, that must be what you mean'. from the game object that you drag in. just gets flung all the way off the screen. You can do that stuff. Obviously up the explosion radius as well. You can play around with that. and see how we like that. it to be in the game when it begins. So I'm going to select my Prefabs folder. the empty space in that folder. what you should be seeing. take off quite a lot of damage. Take off a lot of health, sorry, apply a lot of damage. and the audio source on to those two different variables. we don't need that shell in the game. Delete it out of your scene. and then save your scene. One more time, select the shell. delete it and then save your scene. Okay, so that's the end of phase 5. A little bit of physics and a bit more UI. public LayerMask m_TankMask;                        // Used to filter what the explosion affects, this should be set to "Players". public ParticleSystem m_ExplosionParticles;         // Reference to the particles that will play on explosion. public AudioSource m_ExplosionAudio;                // Reference to the audio that will play on explosion. public float m_MaxDamage = 100f;                    // The amount of damage done if the explosion is centred on a tank. public float m_ExplosionForce = 1000f;              // The amount of force added to a tank at the centre of the explosion. public float m_MaxLifeTime = 2f;                    // The time in seconds before the shell is removed. public float m_ExplosionRadius = 5f;                // The maximum distance away from the explosion tanks can be and are still affected. // If it isn't destroyed by then, destroy the shell after it's lifetime. // Collect all the colliders in a sphere from the shell's current position to a radius of the explosion radius. // ... and find their rigidbody. // If they don't have a rigidbody, go on to the next collider. // Add an explosion force. // Find the TankHealth script associated with the rigidbody. // If there is no TankHealth script attached to the gameobject, go on to the next collider. // Calculate the amount of damage the target should take based on it's distance from the shell. // Deal this damage to the tank. // Unparent the particles from the shell. // Play the particle system. // Play the explosion sound effect. // Once the particles have finished, destroy the gameobject they are on. // Create a vector from the shell to the target. // Calculate the distance from the shell to the target. // Calculate the proportion of the maximum distance (the explosionRadius) the target is away. // Calculate damage as this proportion of the maximum possible damage. // Make sure that the minimum damage is always 0.